/Users/<username>/tvp animation 11 pro/<configuration name>/GeorgeApple OS-X. Those George Scripts are in fact usual ASCII text files and have a “.grg” extension. It is possible to edit or create them with any text editor like Notepad from Microsoft Windows, Text Edit from Mac OS-X or Gedit from Linux. The scripts are in theory working on PC, Macintosh or Linux, whatever the computer used to create them. Once finished, if you click on the just created button, the George Script will then be launched. At every moment, you can stop the execution of a George Script by using the [Esc] key. A window, indicating on which line the execution of the script was stopped, should popup. 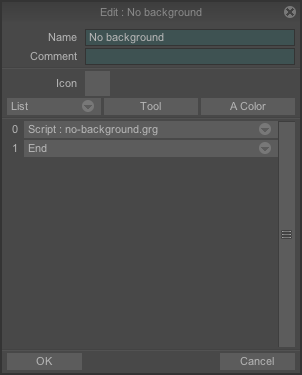 Once a George Script has finished its programmed tasks, the Undo option of the TVPaint Animation main panel allows you to cancel all the changes it has generated.